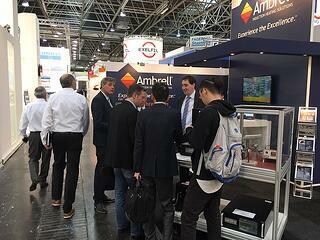 Ambrell is wrapping up a very successful first day at the Wire Düsseldorf in Germany. Our application experts have been busy discussing various induction heating application for the wire and cable industry, such as annealing, pre-heating, wire heating, coating and bonding. Have you been thinking of applying induction heating to your industrial heating processes? Visit us at the show, which runs in Düsseldorf, Germany until Friday, April 8th. We are exhibiting in hall 11 at booth H31. Our team is looking forward to discussing your application requirements over a cup of delicious coffee. Can't make it to the show? In just two weeks, we will be exhibiting at Hannover Messe, so take a look at our agenda and let's make an appointment! Otherwise, read more about our complimentary application testing services and learn how THE LAB works.